Video2160p@30fps, 1080p@60fps, 720p@240fps, HDR, dual-video rec. KARACHI: Police have resolved the mystery behind murder of a teenage girl that took place in Malir’s Saudaabad area on December 5 and was initially seen as an incident of robbery. Alwina confessed to killing her sister with the help of her finance Mazhar after what she said suffering months of blackmailing and sexual abuse at the hands of her sister’s friend who had also obtained sexually explicit material against her. Alwina said she continued requesting that her sister persuade her companion to erase the photos yet without much of any result .She said Ahsan would force her into meeting outside the home and subject her to sexual manhandle.She said she at that point educated her mom about her scrape however she would beat her into hush.Alwina said she looked for help of her life partner Mazhar, who went to their home on December 5 and endeavored to persuade Aleena to erase the photos. Foreign Minister Khawaja Asif said on Monday that 125 out of 128 recent attacks in Pakistan were coordinated from Afghanistan. The statement was made during the foreign minister’s appearance on Geo News’ programme ‘Aaj Shahzeb Khanzada Kay Sath’ aired on Monday night. He added that the civil-military leadership stressed, in its meeting with US Secretary of Defence James Mattis, on effective border management with Afghanistan and repatriation of Afghan refugees. He said the US defence secretary was told that Pakistan’s fight against terrorism was greatly hindered by non-provision of F-16 fighter jets by the United States and that such measures limited their capacity [to fight terrorism]. “It was quite a frank exchange overall, in which there was no hostility,” the minister said of the Pakistani leadership’s meetings with the top US official. Prime Minister (PM) of Pakistan Shahid Khaqan Abbasi has apparently solved the enigma of Finance Minister Ishaq Dar’s resignation and decided to send him on a holiday. The development was unearthed by Dunya News president Kamran Khan in his program Dunya Kamran Khan Kay Sath. He told that the announcement of this decision is likely to be made within 48 hours. According to details, the ministry will be given to a close friend of PM Abbasi following Dar’s elimination. After the National Accountability Bureau (NAB) cases, Ishaq Dar is being criticized continuously for holding his office both by political as well as journalist fraternities. he US will “watch” Pakistan’s choices on President Donald Trump’s new Afghan and South Asia strategy to combat terrorism in its tracks, Defence Secretary Jim Mattis has said. At the same time, Mattis also lauded India’s commitment towards the development in Afghanistan. Trump, while announcing the new strategy for Afghanistan, had accused Pakistan of harbouring “agents of chaos” and providing safe havens to militant groups waging an insurgency against the US-backed government in Kabul. Pakistan has opposed Trump’s Afghan and South Asia policy, saying it ignored the country’s sacrifices in the war against terrorism. But, Mattis during a visit to Kabul said the new strategy was “not exclusive of someone”. Trump’s also policy seeks greater developmental role for India in this war-torn country. Mattis said India has been “very, very generous” in its development assistance to Afghanistan. A National Accountability Bureau (NAB) team on Friday was unable to deliver arrest warrants issued against the Sharif children — Hassan, Hussain and Maryam — at their Jati Umra residence. An accountability court had on Tuesday issued bailable arrest warrants for Nawaz Sharif’s children and son-in-law Mohammad Safdar after they failed to appear before it despite repeated summons. The NAB group, headed by Deputy Director Mehboob Alam and involving Deputy Director Mohammad Kamran and Investigating Officer Imran Dogar, was additionally met with protection from the security staff exhibit at the living arrangement, sources in NAB said.Then, Nawaz’s summons were gotten by his own secretary, Qamar Zaman, in consistence with court orders, sources said.Nawaz had quickly showed up under the steady gaze of a NAB court on Tuesday, putting to rest gossipy tidbits about his choice to not come back to Pakistan and face the courts regarding three defilement references recorded against him.The references took after the Supreme Court’s July 28 decision in the Panama Papers case that had excluded Nawaz from holding open office.”Escaping from the courts isn’t our direction,” he had said in a question and answer session after his appearance in the court.Maryam, Hussain, Hassan and Safdar are at present in London with the weak Kulsoom Nawaz, Nawaz’s companion. The attack in the north of the Afghan capital happened as worshipers were gathered inside Hussainia mosque, one of the biggest Shia centers in the city, for Friday prayers. There was no immediate claim of responsibility but fighters belonging to the Taliban and the militant Islamic State (IS) group have repeatedly targeted the minority Shia community in recent years. A shopkeeper told AFP that the suicide bomber blew himself to bits after he was identified by suspicious civilian guards who had set up a checkpoint about 200 meters from the mosque. Afghanistan has trained and armed more than 400 civilians to help protect Shia mosques during the holy month. 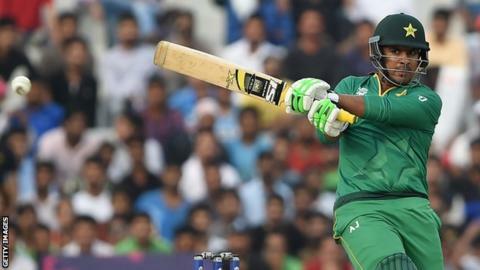 Pakistan batsman Sharjeel Khan has been banned for five years for his part in a spot-fixing ring. A Pakistan Cricket Board (PCB) tribunal handed down the punishment following a hearing on Wednesday, but two and a half years of the ban is suspended. The PCB has been conducting a long-running investigation into corruption in the Twenty20 Pakistan Super League. Sharjeel, 28, has played one Test match, 25 one-day internationals and 15 Twenty20 internationals for Pakistan. The full findings will be released at a later date. Spot-fixing is where the outcome of a particular passage of play is pre-determined, as opposed to fixing the outcome of a match. Scientists have helped solve the mystery of what lies beneath the surface of Neptune — the most distant planet in our solar system. Extremely low temperatures on planets like Neptune — called ice giants — mean that chemicals on these distant worlds exist in a frozen state, researchers say. The team found that frozen mixtures of water and ammonia inside Neptune — and other ice giants, including Uranus — are likely to form a little-studied compound called ammonia hemihydrate. Dr Andreas Hermann, of the University of Edinburgh’s Centre for Science at Extreme Conditions, said: “This study helps us better predict what is inside icy planets like Neptune. Our findings suggest that ammonia hemihydrate could be an important component of the mantle in ice giants, and will help improve our understanding of these frozen worlds. Materials provided by University of Edinburgh.